The final weeks of the year are always busy and stressful. 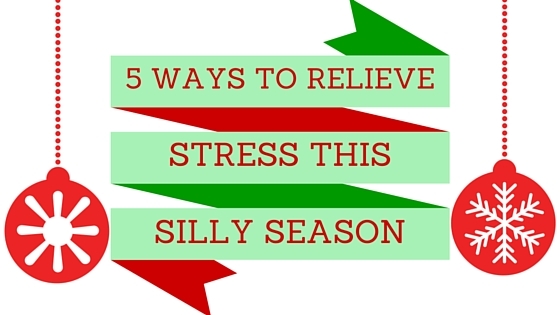 Never ending gatherings, end-of-year school activities, family visits and the cost of Christmas can leave you feeling frazzled and anxious. This can all lead to unhealthy habits such as being too busy to exercise, eating all the Christmas treats and not getting enough sleep. By the time the New Year comes around you are in need of another holiday! Start you’re week by spending 10 minutes on the Sunday night to plan out your week. This can be as simple as noting down the commitments for the week ahead or going into more detail by planning meals and even outfits to save time in the morning. Also, as soon as you commit to an event write it on the calendar! Christmas and New Year is a time for food….lots and lots of yummy hard-to-resist food. It can be very difficult to not continuously pick at the cheese, dips, chips, cookies and cakes, especially when you go from one event to another in the same day! The excuse of “it’s Christmas” is so easy to say but the constant intake of food leaves you feeling yuck and doesn’t help your overall mood and stress levels. Try instead to eat small portions of treats and if you have more than one event in a day choose one of the events to have a treat at instead of having cookies from brunch to dinner. Whilst you’re busy wrapping presents light an aromatic candle to stay calm and relax. If you have a tricky shaped present that just doesn’t want to be wrapped, take a few deep breathes to increase oxygen flow to the brain. I know, I know you’re really busy and finding the time for a massage can be hard. But even 30 minutes of a remedial or relaxation massage can not only physically help relieve stress but also mentally. When your muscles are less tense, your body will thank you! To book an appointment with our massage therapist call us on 6299 3886. Hope you all have a safe and stress-less Christmas and New Year!